Firstly, I need to commend you on your commitment and dedication. Thinking up something different to do with your elf doll every day for almost an entire month, year after year, is no mean feat. I know loads of you guys do it, because over the last few years, December on social media has become an elf-saturated vortex of people displaying the imaginative and adorable ways that they have posed their elves each day, presumably to surprise and delight their children. Good on you guys! 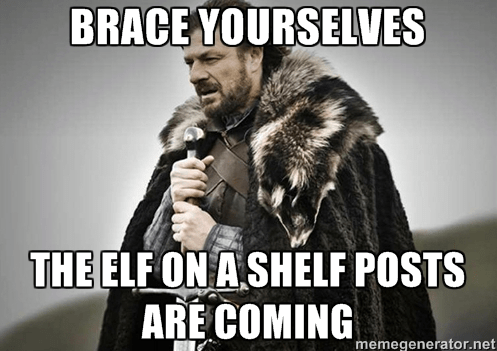 However, I will not be encouraging any elves to adorn my shelves. Not a chance. It’s nothing personal. In fact, it’s fair to say that it’s not you- it’s me. The whole shebang requires a level of organisation that I just do not possess. I’ve seen all the planners you can download, enabling you to plot out your poses well in advance. I think these are probably the reason I saw all the posts appearing in my Facebook feed in November; over-excited parents were already anticipating their elvish shenanigans. Being a disorganised, fly-by-the-seat-of-my-pants type, just the thought of all this planning sends my anxiety levels (and blood pressure) in a distinctly skywards direction. Clearly, the parents in the same disorganised boat as I am are throwing caution to the wind and doing it anyway, because it’s the beginning of December and my social media feeds are also peppered with articles full of lame excuses reasons you can give your kids in the morning when they wake up and see that you forgot to re-position the damn elf. When toys come to life. I get why so many kids like the idea. To them, it’s an extension of the whole Toy Story thing- where toys having a secret world and life of their own is charming, comedic, adventurous and full of excellent life lessons for little ones about friendship and acceptance. However, I am from a different generation. I am from the same generation that most of you excellent, committed and creative elf-on-a-shelfers are and I have to say, I marvel at your short memories. Because the movies I watched as part of a misspent youth (or so my mother used to say) made a lasting impression. They taught me that toys coming to life was almost never a good thing. You see? Horrifying! This is why we can’t have nice things, people! 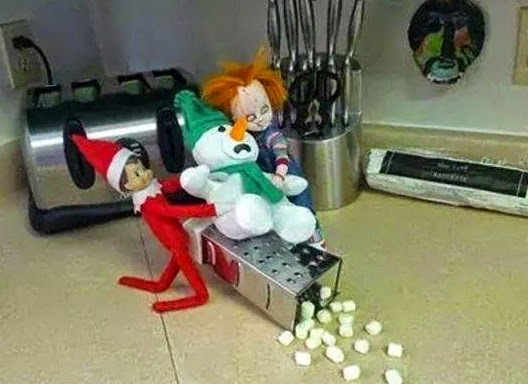 Elf on the Shelf, for your amusement? It doesn’t help that some of you cheeky adults pose your elves in…well, cheeky, adult poses. 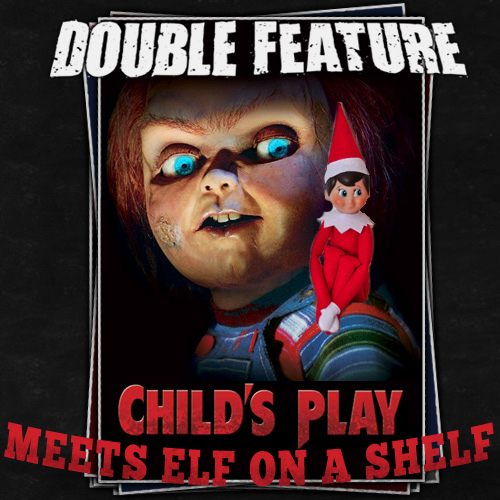 So for people like me, already struggling after growing up with Chucky and other movies where toys come to life and get up to no good at all, (Anyone remember the 1987 classic Dolls? Or Dolly Dearest? Or Silent Night, Deadly Night? Demonic Toys? Blood Dolls? Are you seeing a theme here??) 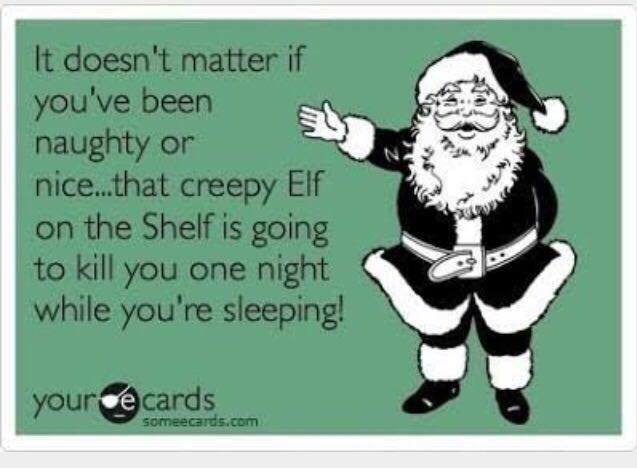 the creepy factor skyrockets when I see pictures of your Elf on the Shelf getting busy with Barbie. Just one of many examples-Via Parent Society. I can’t have an Elf on the Shelf. I just can’t. Creepy on too many levels. I saw this floating around online and it sums up my feelings. ← Why are unvaccinated children a “threat”? Mother’s Day Gift Guide- What NOT to Buy! Oh Pinterest, what are you for?